One of the best ways to reinforce a positive habit is to create a routine around it – and creating the perfect place to write can go a long way toward helping you get into the habit of writing. Whether you’ve just decided to become a writer or writer’s block has you stuck, your very own writing spot could be just what you need to start putting pen to paper. When it comes to where to write, your biggest decision will be whether to do it at home or to leave your house. For some, it’s easy. If you write when the kids take a nap or you get up early to sneak in a few pages before heading to work, creating a writing space at home is the only practical option. On the other hand, if you find your home has too many distractions, working outside the home may be welcome respite that increases your productivity. If you choose to create the perfect place to write at home, designate a specific spot. A home office or home library is a great option, but you can set up a desk or create a small workspace in any quiet area. If possible, section it off with a decorative screen, or arrange your furniture to make your writing space feel separated. Avoid any unnecessary distraction – like a TV set or a window that looks out onto a busy street. The goal is to create one space that you associate strictly and exclusively with writing – not with homework, bill paying, or any other tasks. Writing outside your home can be a great option – and gives you unlimited potential to truly create the perfect place to write. There’s no hard and fast rule on where you can write, but think about places where you feel comfortable, focused, and relaxed. Your local library probably has plenty of quiet work spaces, but you might like the stream of white noise you get at your local coffee shop. Some cities even have services that offer shared office space, where writers can pay a monthly fee and create a designated workspace amongst other writers. Don’t be afraid to experiment and try several writing places until you find the one that’s best for you. No matter where you create the perfect place to write, here are a few tips to help make that space successful. Firstly, be sure you have the tools you’ll need. Of course, you’ll need a notebook and pen or a computer, but you should also have a dictionary and thesaurus (or an Internet connection to access both online). Secondly, make your writing space personal and special. Use your favorite coffee mug or keep a stash of a special candy you enjoy only in your writing space. Finally, be flexible! If a group of noisy teenagers invades your café or you can’t get over a bout of writer’s block – don’t be afraid to find a new spot. 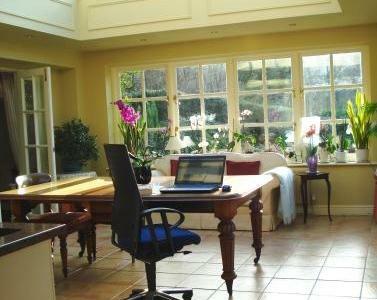 The perfect place to write is only perfect when you’re inspired, productive and creative. Find new spaces as necessary to keep your creative juices flowing, and you may find your new novel practically writes itself!